I'm trying out raw with my golden now, labrador (Mum's dog!) is on Fish4Dogs and Nature's Harvest/Forthglade still. Rupert really likes it that's for sure, not sure what I would go back to if it doesn't work out as the Fish4Dogs and Nature's Harvest was good but his belly tends to hate most things. What do you guys and gals feed? Re: What do you feed your dog(s)? I feed Quest working dog food my guys go nuts for it, its the only food Kira has eaten every day without fail! 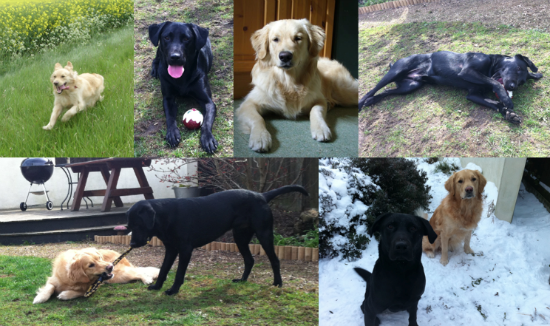 Wainwrights wet and dry puppy atm but moving Storm onto Adult when Angel comes as he is a big boy and it wont hurt him. [TREATS] Raw carrot/odd choccie bone, run out of F4D treats now! Wet meat - James Wellbeloved 1x a day in the evening. Raw egg once a week. I feed Skinners and they get the odd chicken carcass & tripe as well as fish4 treats. I feed csj brillant food they both love it and look really good to.